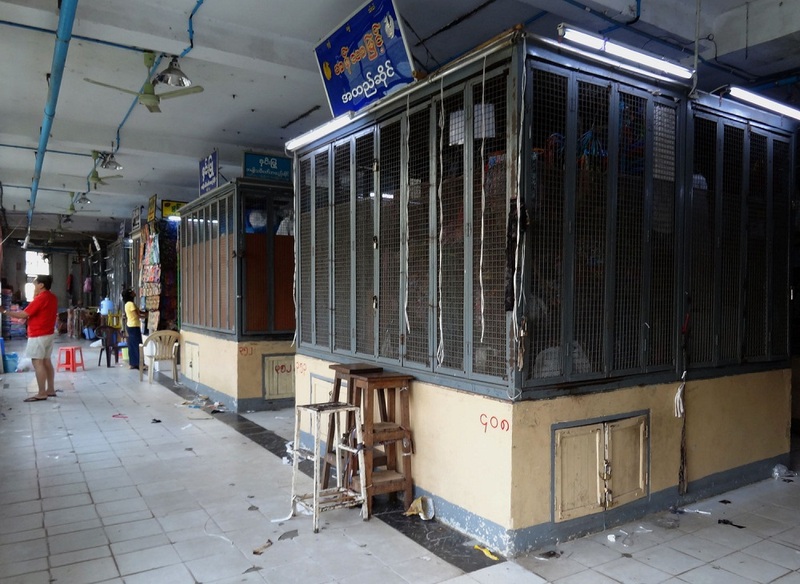 Shops at a market in the Muslim-populated Mingalar Taung Nyunt neighborhood of Rangoon stay shuttered on March 27, 2013 amid fears of violence. A U.N. envoy has raised concerns of state involvement in attacks on Muslims in riots gripping central Burma but President Thein Sein’s office has rejected the charges as baseless. The charges came as terrified Muslims fled the riot-hit Bago division for Rangoon, Burma’s largest city, amid concerns over the prospect of fresh violence after clashes erupted nine days ago. President Thein Sein’s Buddhist-dominated government has “not done enough” to stem the violence and campaigns inciting hatred against Muslims, he said. “This may indicate direct involvement by some sections of the state or implicit collusion and support for such actions,” he said. President Thein Sein has declared a state of emergency and sent troops to quell the violence, which has left at least 42 dead and 97 hospitalized, according to the latest police figures reported Thursday. Presidential spokesman Ye Htut said in comments on his Facebook page that the government “absolutely denies” charges linking state actors to the violence. “In fact, Mr. Quintana does now know the situation on the ground and made his comments based on secondhand hearsay, not facts,” he said. “It is regretful that his remarks ignore the efforts made by security forces, civil society groups, and religious organizations [to contain the violence],” he said. Mobs have targeted mosques, homes, and shops in arson attacks across central Burma since the violence erupted in Mandalay division’s Meikhtila city on March 20 and quickly spread to the Bago region just north of Rangoon. State media have reported 1, 277 homes have been destroyed in unrest that has made almost 13,000 people homeless. Burma is a predominantly Buddhist country but about four percent of its 60 million people are Muslims. There are big Muslim communities in Rangoon, Mandalay, and towns across the impoverished country’s heartland. On Friday, a group of 100 Muslims and six Buddhists fled to a mosque in downtown Rangoon’s Muslim-populated Mingalar Taung Nyunt township following attacks in Bago’s Minhla township, two to three hours from the city by car. The group had been hiding in a Buddhist monastery in Minhla under the protection of monks there, opposition leader Aung San Suu Kyi’s National League for Democracy parliamentarian Phyu Phyu Thin told RFA’s Burmese Service. But after they felt they were no longer secure there, rescuers working with the help of local authorities brought them to the mosque in Rangoon, according to Phyu Phyu Thin. Dusk-to-dawn curfews are in effect in many areas of Bago and police have said 68 detainees were being charged for their role in the unrest. In Padigon, a small town west of Bago city, at least five unidentified people were shot by the police and military when they were attacking Muslim-owned businesses and homes on Thursday, as Thein Sein authorized security forces to use deadly force to quell violence. Thein Sein gave a televised address on Thursday warning “religious extremists” that they would not escape prosecution for participating in acts of violence. The violence is the worst since clashes between Muslim Rohingyas and Buddhist Rakhines in western Burma left at least 180 dead and tens of thousands homeless last year. The clashes in Meikhtila last week were sparked by an argument between a Muslim gold shop owner and his Buddhist customers. Reported by Tin Aung Khine for RFA’s Burmese Service. Translated by Win Naing. Written in English by Rachel Vandenbrink. Mr Quintana and UN lost the purposeful work of UN. In Bangaladesh ,Bangali army officers are training the terrorist to Burma. Mr Quintana enlerging regular fact to bigger and heavier. To day in Indonesia , Why will you do? Absolutely Detention Officers Know and neglect. Human rights activists, organisations and groups are desperate to keep their jobs and funding now that Myanmar has opened its doors to prying eyes. Tomas Ojea Quintana is no exception. Before making outlandish allegations, Mr Doubting Tomas should have spoken to his UN colleague Vijay Nambiar, who last week visited the riot-torn town of Meikhtila, accompanied by Myanmar's Islamic Council chief. The *UN expert on HR* is totally lost when it comes to on-the-ground Burmese politics. For instance, why would the Government-of-the-day sabotage its economic and political reforms by inciting religious hatred and violence? He's playing into the hands of dark forces out to wreck the transition to democracy by attacking Myanmar authorities with baseless charges. Looking at a nation through the prism of HR has blinded him. Mr Quintana would do well to chase the ghosts of military dictatorships in his homeland – Argentina. Leave the Burmese alone. We don't need outsiders to fix our problems.